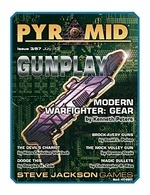 This is an article-by-article review of Pyramid #3/57: Gunplay. While I don’t usually do this, the subject matter of this issue is just what this blog ordered, and even if one of my own articles is in it, I really think every article, and nearly every word, of this issue is worth reading. So, a series of (hopefully) shortish posts. You can find the installments on Modern Warfighter: Gear here, as well as The Devil’s Chariot, Brock-Avery Guns, and Dodge This. For those who like their firearms huge, impractical, and conferring massive bonuses to Intimidation, the Nock Volley Gun is for you. This article details a very real piece of kit, giving the weapon’s history, description, and a brief bit on use. Invented by the same person who gave us the double-barreled shotgun, the weapon was created to deal with boarding actions on ships. As mentioned in the article, the prototype had two issues: bone-cracking recoil and a tendency to set your ship on fire. Slow to load and hazardous to fire, apparently it never really took off. Go figure. The weapon description is complete and focuses mostly on the rules and optional rules (six of them, on Recoil, Misfires (common with this weapon), Muzzle Blast, Intimidation, Special Powder, and a much needed Speedloader. Each section is well laid out, brief but informative, and tells a prospective GM or player what they need to know to capture the feel and use of the weapon in play. The weapon only saw a limited period of actual service (1780-1815) and would be suitable for Age of Sail type stuff. Otherwise it features in a few TV and Movie appearances, and so would make a nice fit there. Hard to see in the smoke, but Master and Commander features one! A short review, but this article delivers. 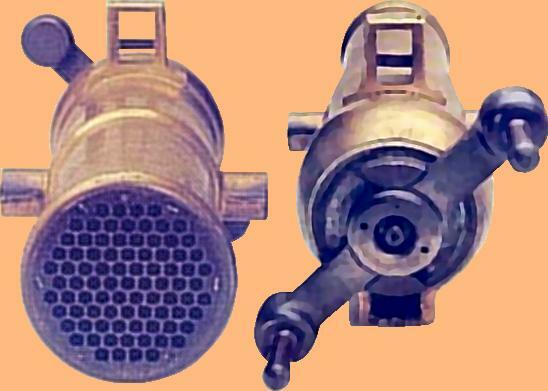 It’s all you wanted to know about a unique piece of kit, with optional rules to simulate why this gun might have been designed, but also ultimately failed. It’s tightly written, rules focused, and terse in a good way. When you finish, you will know whether your character (or a flavorful NPC) might want to carry one (gah! heavy! ), or how to use one if you stumble across one mounted to a ship’s rail. There are also enough optional rules that adding volley concepts to fictional pieces of weaponry are a very real option for game and world-builders. So if you want a volley assault rifle, well, Graeme’s got you covered. This is an article-by-article review of Pyramid #3/57: Gunplay. While I don’t usually do this, the subject matter of this issue is just what this blog ordered, and even if one of my own articles is in it, I really think every article, and nearly every word, of this issue is worth reading. So, a series of (hopefully) shortish posts. You can find the installments on Modern Warfighter: Gear here, as well as The Devil’s Chariot, and Brock-Avery Guns. Reviewing my own work. How terribly narcissistic. This article tries to break down some alternate rules for dodging projectiles of all speeds. It’s organized in three sections, and includes one large box on why rules such as these might not be a good idea for inclusion in the Basic Set, and ends with some tables summarizing some of the suggestions for penalties, modifiers, and die rolls given in the article. This section spends about a page on perception rolls. No, really. The basic rules hang a lot on the question of whether or not you are aware of a foe, because tucked right in the definition of Active Defense is the prohibition of using one against an attack you can’t perceive in some way. The sub-sections includes a bit on GURPS’ default assumptions about perception rolls and awareness, and then provides some suggestions for GMs that want to have a die roll determine whether a foe is currently being tracked. Lots of penalties, arcs of vision, and it touches on Danger Sense and Enhanced Tracking, two Advantages that can help with Perception checks. All of them end the same way: lacking other options, you can defend against that which you’re aware of. If you’re not, you can’t. A very short section containing an optional rule. If post-hit defending breaks your SoDoM (Sense-of-Disbelief-o-Meter), then you’re given a variant: Move and Attack (Evasive), which allows you to dodge like a funky monkey, giving penalties to be hit, but taking penalties to your own actions as well. The last section gives details on using these options with incoming projectiles. First, seeing an incoming ranged threat, notionally from a thrown car (I should have worked that in for supers) or a hurled axe all the way down to rifle bullets. This is basically a determination of the size modifier of the threat, and if you can resolve it, a Perception roll based on size and movement. From there, you can try and stop it, but a method of penalizing defenses based on projectile speed is given for those who feel that fast attacks should be harder to parry, block, or dodge. The rules are rationalized in the case for using objects or shields as cover, as well as a short discussion of how they work with spells. Also lists the penalty for dodging lasers. For whenever that comes up. Finally, for those who know and love Tactical Shooting, which also has some harsh rules for the dodging of bullets, a few words are spent on how to mesh this article with those rules. This is an article-by-article review of Pyramid #3/57: Gunplay. While I don’t usually do this, the subject matter of this issue is just what this blog ordered, and even if one of my own articles is in it, I really think every article, and nearly every word, of this issue is worth reading. So, a series of (hopefully) shortish posts. 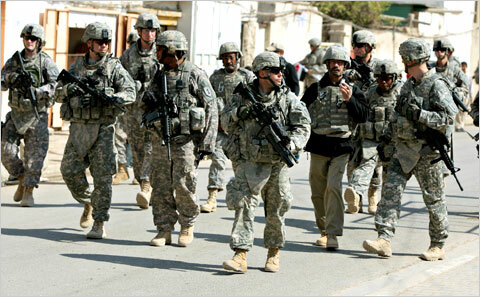 You can find the first installment on Modern Warfighter: Gear here. The Devil’s Chariot is basically ‘everything you could ever want to know about the Mi-24V “Hind” helicopter. I mean everything. The article is divided into five sections. And the shapes of the locusts were like unto horses prepared unto battle; and on their heads were as it were crowns like gold, and their faces were as the faces of men. And they had hair as the hair of women, and their teeth were as the teeth of lions. And they had breastplates, as it were breastplates of iron, and the sound of their wings was as the sound of chariots of many horses running to battle. And they had tails like unto scorpions, and there were stings in their tails: and their power was to hurt men five months. So after a short introduction on what may well be, as he says, “The world’s most famous helicopter,” he gets right to it. This is the introductory section. The vehicle is described in real-world terms, broadly. It covers some nicknames, as well as the production and usage history, including the Mi-35 export version. It then gives a brief rundown of who uses them, and in some cases how many were purchased and remain functioning. You definitely get a flavor for who bought them, and also that you’d better be prepared to spend significant maintenance effort on them – 75% of Uganda’s purchased rotorcraft are out of service! When Hans says detail, he means detail. The first bit covers the construction and armoring of the airframe, again in real-world terms, making it amenable to SWAG conversion to other systems that can base armor protection off of type and thickness of material. 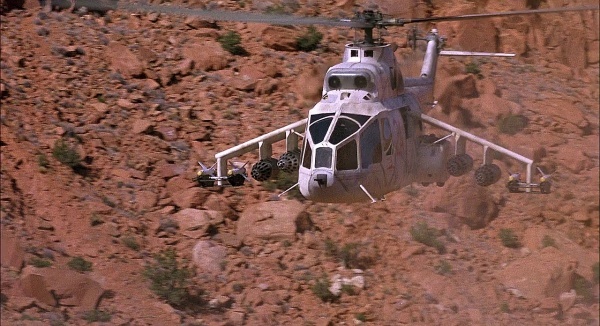 It briefly touches on the helicopter’s reputation for unvulnerability (the famous scene from the original Red Dawn where it shrugs off an RPG hit comes to mind) and where that may have originated, and where it’s wrong. Engine, payload, fuel system, electronics. Crew compartment and flight systems. GURPS skills required to successfully operate the craft. Gunsights. And a detailed and specific Hit Location Table with location penalties to hit each place, with footnotes talking about details and DR of each location. It’s well done, and I think all vehicles should have one. In case you want to bring friends, Hans describes the layout and capacity of the cargo/passenger area, you can bring either four or eight friends along. Hans has a penchant for weapon statistics and details, and this article proves no exception. He probably lists every single possible armament for the craft. Though the carrying capacity is surprisingly limited, mostly by engine power, the hardpoint rating for each mount is given. Then he details all the weapon loads used for the craft. Without going into too many details, any new weapons are given the usual treatment. The write-ups include wonderful details such as design quirks (you can only fire ten bursts of any size with the main 12.7mm machinegun!) in addition to usual ammo load and usage notes. The vehicle statline is provided on p. 20, along with the detailed armament table summarizing nine different weapons that can be mounted to the vehicle. The article finishes up with some notes on use. First, how to get one in the first place, by nefarious or not-so-nefarious means. Hard to approach but easy to steal, seems like. Notes on how they’re used with the rules in GURPS Action 2 for chases and attacks are provided. The article touches very briefly on operational employment (in pairs or trios) and covers why. A text box notes what movies you can see the Mi-24 (or mocked up ones) in action. The last few paragraphs cover in meticulous detail every single thing found on the pilots or in the cabin of one of these aircraft. Right down to insect repellant and water purification tablets. Hard to say anything other than “it’s that complete.” If you are looking for a scary adversary or a worthy prize – but not something as sophisticated and expensive as say the AH-64D – you’ll find it here. The article is encyclopedic in scope and tone, but I’d be hard pressed to find anything missing. Peter and I went back and forth quite a bit on structuring the article, and while I did a lot of the number crunching (it’s what I do), Peter is really good about making sure that things work in play. He’s also a big fan of minimizing the number of rolls and contests, so that play is minimally disrupted. So the article, though he basically said “it’s all you” and gave me sole credit, is as much his as mine. Modern Warfighter: Gear Slowly but surely you’ll be getting an entire book out of this 🙂 This article covers the non-weapon gear for a modern warfighter that currently doesn’t have an entry in the gear books. It also goes into some detail on military uniforms (I kept this very generic and rules legal) because that’s actually a rather interesting subject all by itself (this is kept very generic and I avoided US-centric absolutes when possible). Need stats for the Switchblade missile/UAV? That’s on p. 13 under Loitering Munition. Curious about those barricades you see around bases and embassies? On p. 14 they are described under Multi-Cellular Defense Barriers. What are the stats for modern FROG gear and other infantry uniforms? Check p. 8 easy peasy. Canine tactical harnesses? See p. 11 my friend. I got it all covered. The Devil’s ChariotThe very image of badass Russian hardware for decades: The Mi-24 Hind. Han’s left no detail unmentioned in this article, especially for applying this vehicle to a GURPS Actioncampaign. 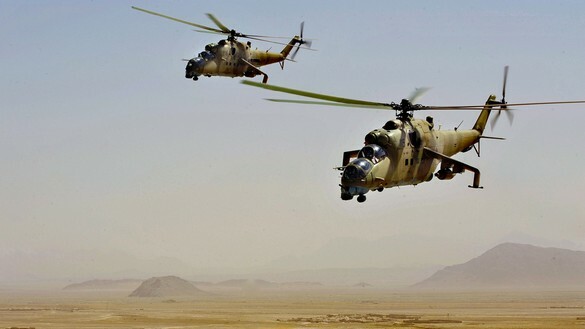 The article covers the Mi-24V in detail, including information on the electronic warfare systems, what you can attach to the hardpoints, the flight controls, and even the seat layout (no graphics, unfortunately). The guns obviously get the Han’s level of detail and there NINE new weapons with full stats and background information provided. Curious as to what was contained on the survival gear of the crew? Did you know it had 20 water-purification tablets? Well now you do, because Hans has listed everything (with High-Tech page references). Eidetic Memory: Brock-Avery GunsThe manufacturer may be fictional, but the guns have detailed backgrounds and at least one is listed for every major era of play. The grave gun was particularly interesting and I had to look it up (yes, they really existed). A good example of how to take a theme and apply to something that is usually considered just an appliance. Dodge ThisDouglas “Crunch King (in training)” Cole wrote this article to address the common question of “why is it so easy to dodge ranged attacks in GURPS?” After all, even in Rifts you have that -10 to dodge and that’s hardly a paragon of realism! Well, he breaks it down for you. So complete is the article that I don’t really know what else to say. IF a player ever gripes about the dodge rules, especially the notes from Tactical Shooting, I’ll just print this off and hand it to them without saying a word. Maybe a grunt of command to actually read the entire thing. What’s also interesting is that he extends the rules for Parry, Block and Dodge to cover all sorts of ranged attacks (and not just thrown weapons) – even spells! I found the rules regarding the insane muzzle blast of this gun to be particularly noteworthy! Magic BulletsNeed to put a diamond shard in your bullets to hunt that monster? This article has you covered, my friend. Obsidian cored rounds with a wolf tooth enamel coating? It’s just an order away! This article extends the already voluminous list of “special loads” for bullets as seen in Horror, Monster Hunters, and Pulp Guns. Random Thought Table: Make Each Shot CountHere Steven discusses using ammo itself as a pacing mechanism instead of just a largely forgotten bit of character sheet accounting. As he notes, many people approach this from a video game perspective where acquiring ammo is something you can do at a dead sprint with daemons spitting blood a footstep behind and you can casually load it even underwater or while on fire. IMO this is one of the best Random Thought Tables in a long time, and I’m sure there will be a lot of GMs who get their eyes opened to these types of game balancing and plot pacing concepts. I had a good time writing my own article. I won’t say that it just fell together, but Peter’s influence made itself felt in an entirely productive way. Not only did knowing I had a prospective co-author mean I buckled down and got my stuff done (I’m better with a deadline), but I sort of had to ask myself WWPD as well as WIWIP (would it work in play) more often than I usually do. That probably means I asked it just less than I should. I tend to write as a menu of options, fully endorsing what I feel is a core GURPS concept: “pick the rules you want, toss the rest.” Some of my options you might not like. Great! Ignore them. I write a lot of my rules articles to address issues that I see that bug me, but they might not bug everyone. That Ken really liked my article is very gratifying, and I think that one of the reasons this article works (and rereading it, I do think it has a lot of goodness to it) is that it directly addresses an issue that, quite seriously, had every single player (including my wife) groaning about how unrealistic it was to just keep dodging laser beams. No amount of “but you’re dodging the line of fire” was going to make up for that. So I knew there was something there, and the article on MECE applied to attack and defense rolls cinched it up: there were several options that might get it done. From there, it was a matter of some clarifying discussion with Peter, a first draft, and then my usual suspects did the proofread and comment. I found so much utility in my Technical Grappling playtest that I try and hit up some of them, plus a few others, as often as I can to ensure I don’t miss important bits. If you haven’t read the article, I’d certainly appreciate it if you would! If you have, I’d love to hear your thoughts – even if you thought it lacking. Thursday is GURPS-Day, and because of a quick trip back and forth to California from Monday through Wednesday, I’m a bit behind. Life gets that way. I admit I don’t take “canon” very seriously. Canon is my world specific. I toss stuff out at random at my whim which is definitely encouraged by GURPS. But I would absolutely consider something in Pyramid to be assigning it “official” status. Writing for GURPS is kinda hard. The system itself isn’t that difficult – there are really only a few core mechanics. But depending on your interest, you’d best be at least passing familiar with what has been done on the subject you’re interested in. Even if you’re trying to cover new ground, it’s often a good idea to know what toes you’re stomping on. Ten . . HUT! : Well, this provides finer gradations in Military Rank. Most useful if you’re actually building a character, so while it can be applied to existing games, once the dude is written, there’s probably not much point. The Big Guns Thing: Can be used as a drop-in for any weapon, even in 4e. It also has a bunch of (then) house rules for injury, some of which are now more-or-less canonical in 4e, some not. Armor Revisited: Optional rules, can be done in any game, even retroactively, and dropped if you don’t like ’em. So this one’s portable. The Deadly Spring: Sort of like the guns article, in that it can be used retroactively (it’s a design system), but it mucks with the stats of a common muscle-powered ranged weapon, and if your GM goes on a “realism” kick, might nerf your concept. Also, you might want gonzo bows for Dungeon Fantasy. So YMMV. The Last Gasp: Yeah, this one has real potential to make character concepts play very, very differently. It makes HT really important. Even more important than usual! This one probably needs to be adopted at the start of a campaign – or at least with careful consideration. Delayed Gratification: I wrote this article so it could be dropped into an existing game. So this one’s portable. The other reason it’s hard is that, well, it’s not fiction. It’s technical writing to a very specific style guide. There’s a WYSIWYG template with the proper SJG styles, and using them can be hard to master. The formatting used to write up (say) Advantages, Templates, martial arts styles, or whatnot are quite specific, and can be easy to get wrong. They’re quite picky about pesky things like grammar and stuff. It’s every bit as technically precise to write for Pyramid as it is to write an e23 supplement. The nice thing about it, though, is that it can be as short or long as you’d like. Well, if +Steven Marsh accepts it. My shortest for GURPS was probably Armor Revisited at about 1,700 or so words. My longest, never to be repeated on pain of death and mockery, was The Deadly Spring, at a mind-boggling 11,000. For what it’s worth, every word in Dungeon Fantasy 12: Ninja, including the index and table of contents, pull quotes and marketing pages, is about 14,000 words. So Deadly Spring is basically as long as a full e23 release. That’s a GURPS supplement, right there. On a subject so esoteric that I doubt it would merit a full release – but because there’s Pyramid, it doesn’t need one. Lastly: if you do want to write for GURPS, you want to start with Pyramid. I’d probably target something on the order of 3-5 pages in the magazine, or about 2,500-4000 words. Long enough to show you can do it, not so long that it’s a huge risk to print. But make no mistake: GURPS is Pyramid, and Pyramid is GURPS. Grar!